You’ve probably seen the bumper stickers asking people to “Practice Random Acts of Kindness.” The message is good, but how many of us actually make the effort? 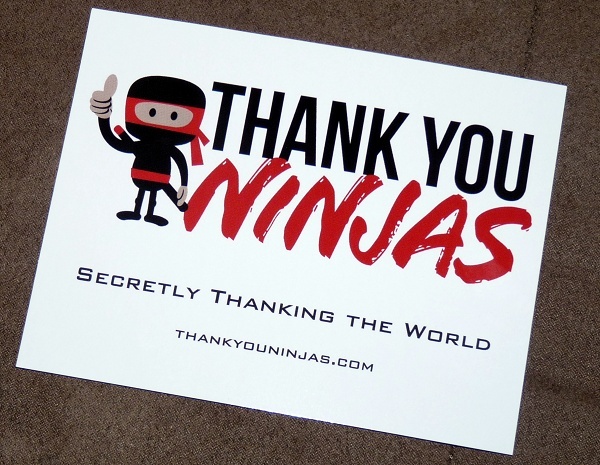 One organization, called “Thank You Ninjas” is doing just that with a simple mission: to secretly thank the world. How do they do this? By sending anonymous Thank You Cards. Ten years ago, Sarah Carmichael, who lived in downtown Toronto at the time, began sending Thank You cards to random strangers. Important to Sarah, known as The Original Ninja, was that each card was sent anonymously. For 10 years she had never been caught. Only recently, when the Toronto Star caught up with her for an interview, was she exposed. Earlier this week I had the opportunity to question Sarah, to shed a little light on being a Thank You Ninja. Ten years ago you began sending thank you cards to strangers. What inspired you to do so? I had been hearing a lot about gratitude. There seemed to be a growing focus on living a life of gratitude and I felt like that attitude needed to be extended to other people. It was an endeavour to acknowledge people and feel connected to those beyond my personal experience. How many people did you initially send cards to? I used to send up to five cards a time, a few times a year. Over the past decade, it’s safe to say I sent upwards of a hundred cards. I didn’t keep track, though; I just sent them when I felt moved to. Where did you get the names of people to send cards? Initially, I got names from the online phone directory. It was completely random. I didn’t know a single person I sent a card to. Later, I started to send cards to people in my neighbourhood and community. Those ones often only had an address with no name. Why send cards randomly, rather than to people you know? I never sent a card to someone I knew for a number of reasons. The most compelling reason was that I wanted to reach people who may not have someone in their lives who appreciated them. If people were feeling lonely or discouraged, I wanted them to know that they are worthy – I didn’t have to know them to know that. The other main reason was that it was something I did quietly; no one knew about it and I wanted to keep it that way. 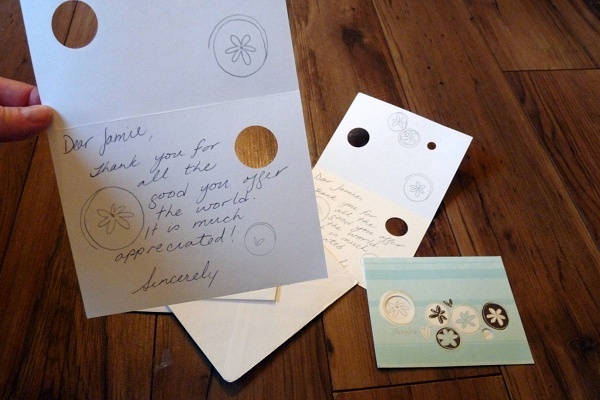 Why do you choose to send your Thank You’s anonymously? The anonymity is the key element to Thank You Ninjas. I choose to send anonymous thanks because there is no expectation of response or reciprocity. The moment is all about the recipient. What are the most common messages you send? When you first started sending cards, did you expect you’d still be doing so ten years later? I didn’t think too much about it in the beginning. I definitely never thought it would become what it has, a movement inspiring other people to send anonymous thanks! How did you come up with the name “Thank You Ninja? I came up with the name Thank You Ninjas a few months ago when I started thinking about how I wanted to share it with the world. Ninjas are masters of stealth. Because anonymity is key, I wanted a name that represented that. How did your idea become a movement across Canada and the U.S? I have been blown away by the support I have received. Less than two weeks after I launched http://thankyouninjas.com, The Toronto Star wrote a story about Thank You Ninjas and posted a video of me on torontostar.com. That garnered the movement a lot of attention and exposure and it’s been growing steadily since then. People from all over Canada and the USA have been ordering postcards to send around the world, use in their workplaces, and place in gym lockers. If some of our readers want to become Thank You Ninja’s, what should they do? They can visit our website, order postcards at http://thankyouninjas.com/store and visit “Become a Ninja” http://thankyouninjas.com/be-a-ninja for ideas and creative ninja moves! According to the Thank You Ninjas website, since they were organized less than a month ago, they have reached an exciting achievement. They sent out their 1,000th Thank You Ninjas postcard. ← Seizures and Bipolar Disorder: Is There a Connection? Oh wow, she is so lovely to think of others and send them rays of hope, appreciation and love. Every one wants to be appreciated and I believe Sarah has done wonderfully in sending out her messages. Very cool! I love the concept, and am intrigued by the flexibility of the message. I generally think in such specific terms that I would always be looking for a reason to point out to say thank you, but perhaps the recipient’s most meaningful gift to the world is something I would never have noticed. This concept allows the recipient to draw out happiness that they’ve done whatever they are most proud of sharing, and that’s pretty darn cool. You go Thank You Ninja! I love the idea of this! I’m feeling like maybe I should become a “Thank You Ninja.” I am always looking for a way to brighten a stranger’s day, even if it’s something as simple as allowing them to cut in front of me in line or a wave and a random smile. How cool that you were able to interview her. You are doing a really good job at your job, Bradley. Proud of you!